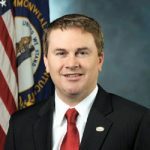 On September 6, Republicans in Kentucky’s 1st Congressional District nominated James Comer for a special election to replace U.S. Rep.
Whitfield announced his resignation last week, about one year after announcing he would not seek re-election this year. Republican Gov. Matt Bevin on Tuesady called a special election for Nov. 8 to elect someone to fulfill the remainder of Whitfield’s term, which expires in January. Comer is already on the Nov. 8 ballot as he seeks a full, two-year term in Congress. He faces Democrat Sam Gaskins, who is likely to be the Democrats’ nominee for the special election.